Ski jumping was one of the eight sports that debuted in the first Olympic Winter Games in Chamonix, France in 1924. Women will make their ski jumping debut in the Olympic Games in 2014. How is ski jumping scored? What is the wind & gate system? What gear do jumpers use? Do athletes jump in the summer? Ski jumping is a sport in which skiers go down an in-run, jump, and attempt to land as far as possible down the hill below. Ski jumping is widely considered one of the original extreme sports. It was one of the eight sports in the first Olympic Winter Games in 1924 in Chamonix, France. Women made their ski jumping debut in the Olympic Games in 2014. What is the anatomy of a ski jump? While athletes use power and technique to jump and fly (relying on years of muscle memory), the most important assets to a ski jumper are mental strength and nerves of steel. 1. IN-RUN - The jumper slides onto a start bar at the top of an in-run, then pushes off and folds into a crouching position with arms at their sides and skis aligned in icy grooves (winter) or porcelain tracks (summer). Balance is critical in the in-run as the jumper is going 60-plus mph. The skis must remain flat on the surface of the in-run, not touching the grooved track's sidewalls. Any extra friction reduces the speed, which ultimately makes for a shorter jump. 2. TAKE-OFF - As the jumper approaches the table (or take-off, which is at -10.5 degrees) physics and skill take over. The athlete combines their speed, gravity, and 1.7 times their body weight to jump and push away from the take-off -- all within a margin of a tenth of a second. The jumper must remain fluid in flight to be able to adapt to the possible changing wind conditions. Sometimes jumpers will move their arms slightly to realign the flight curve and look for the ultimate lift to remain airborne longer. A jumper is never more than 10-15 feet above the ground, following the contours of the hill, on a 90-meter or 120-meter jump. 4. LANDING - Landings actually can be the easiest part of a ski jump. Landings depend on balance and weight distribution. As the jumper loses lift, they prepare for a telemark landing -- one foot ahead of the other -- with arms spread to the side and slightly bent knees to absorb the light impact. The jumper then skis to a stop in the out-run. The entire jump -- from start bar to landing -- takes less than 10 seconds. Each hill has a critical point, or K point, which is the average distance (or par) in which the jumper aims to land. The K point is where the landing hill starts to flatten out from an average of 35 degrees — about two-thirds the way down the landing hill. • A K90 (normal hill event) has a K point of 90 meters. • A K120, (large hill) has a K point of 120 meters. Jumpers get an automatic 60 points per jump if they land on the K point. Points are added for each additional meter that jumpers go beyond the K point, or points subtracted if they come up short. Five judges can award a maximum of 20 points for style. Judges are looking for the following to deduct: flight, landing, and outrun. The lowest and highest of the judges' scores are discounted and the style total is added to the length total to produce a final score for the jump. How is wind and gate compensation calculated? Ski jumping is an outdoor sport and the wind conditions can change from jumper to jumper. To make the competition as fair as possible, a new judging rule was enacted in 2009. The GATE RULE allows the start gate (or start bar) to change within the same competition round. A length factor (f-value) is inserted, which specifies for each individual jump, how the length of a jump is influenced by changing the starting gate. The WIND FACTOR is used to compensate the changes of the wind conditions between the jumpers. A jumper who gets tailwind receives extra points, while a jumper who gets headwind will have points deducted. Points from the wind and gate compensation system are added or deducted as part of the overall score. What gear do ski jumpers use? BOOTS: Ski jumping is a Nordic sport and thus uses free heel equipment — the athletes' boots are attached to the skis but only at the toe. The boots are made of stiff leather, and when laced up lean forward at an angle, which helps the jumper stay balanced in the in-run and in flight. SKIS: Jumping skis are lightweight, wide and long, 145% of the athlete’s body height in centimeters, to catch air and help the athlete fly and create lift. A skier who is 178 cm (5ft 10in), for example, will use a custom-made ski that is 260cm long (178 cm + 82 cm). SUIT: The suits are much like a wet suit but are made from a thick, spongy material that facilitates "lift". The suits are only allowed to let in and out a minimum of air. That amount is controlled by International Ski Federation regulations, which also state that a suit cannot be more than 2 cm away from the body. OTHER: Jumpers also wear a protective helmet, ski goggles, and gloves. 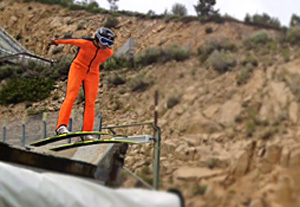 How do ski jumpers train? 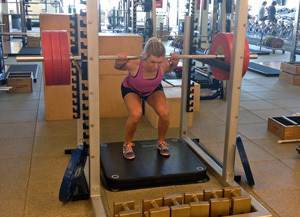 During the summer and early fall, elite ski jumpers spend three days a week in the gym and three days jump training. Gym work-outs include weight training and plyometrics or "plyos", which are exercises that make muscles exert maximum force in a short amount of time. The goal is to increase speed, power, and "explosive" muscle ability. Athletes will do aerobic exercises in the afternoons, such as running, biking or hiking. Jump training consists of 2-hours of warm-up and on-hill jumping -- taking anywhere from 4-7 jumps. Over the course of a year, an elite athlete can jump 800-1,000 times. Can you ski jump in the summer? Yes. Jump training and competitions take place in the summer on hills equipped for non-winter jumping. The in-run is made of grooved porcelain tracks with a trickle of water running through that mimics the icy, snow-packed tracks in the winter. The landing hill is made of plastic "grass" that looks similar to green uncooked spaghetti noodles about a foot long, overlapping like shingles on a roof. Water is sprayed on the landing hill to reduce friction with a jumper's skis. Athletes can go just as fast down the in-run and just as long in distance as in winter jumping. However, the summer heat can strain the jumper more than the cool air of winter, not to mention the discomfort of wearing a spongy, thick suit. When can you start ski jumping? Most start ski jumping between ages 5 and 8. Kids start off on 5-meter, 10-meter, 20-meter, and 40-meter hills, spending years working on technique to be able to one day jump the 70-meter and 90-meter hills — and eventually the 120-meter.